Rab is one of the islands in Kvarner Bay archipelago located between Krk in the northwest and Pag in the southeast. There are several towns and places scattered over the island, mostly on the south side protected from the wind Bura. South of the island is home to one of the most beautiful holm oak forests in the Mediterranean. 1. Hotel International*** - Hotel Rab is located in the center of the old city. Because of the very mild climate of the island, the promenade along the sea and the large park surrounding hotel Rab are excellent places for senior citizens in winter, spring or autumn. In the summer, nightly entertainment in numerous clubs and the lively Mediterranean atmosphere are particularly attractive for younger generations. 2. Hotel Imperial**** - Valamar Imperial hotel is an adults only hotel located close to the beautiful town park as well as the beach and a lively city center full of cultural sights. It was built in 1927. and at the time was one of the first hotels on the island. Hotel offers numerous services like Gin and Pool Lounge bar, restaurant Veritas, Wine bar and a wellness center with an indoor pool. 3. Hotel Padova**** - Hotel Padova is situated in the bay of Prva Padova on island Rab, directly on the sea approximately 5-10 minutes of walk from the old town Rab. It offers a pleasant and comfortable stay throught the year. Due to various hotel services it has become a frequent choice of families with children. Special attraction on Rab is Chivalric tournement of crossbowmen which are held in honor of the town patron St. Christopher. These medieval games are held on May 30 and July 27, while a solemn march-past in the town is organized on Assumption day, too. On these occasions Rab offers to its visitors a whole series of programs worth seeing. Rab is a typical medieval town surrounded by roman walls. Amazin for star hotel Arbiana**** is located in the heart of town Rab. More budget friendly is definitely hotel International*** located close to the sea, surrounded with a beautiful mediterranean garden. Those who love spending their holidays in mobile homes we strongly recommend Padova premium camping resort**** which is equipped with various services and amenities designed to make every guest feel most comfortable. 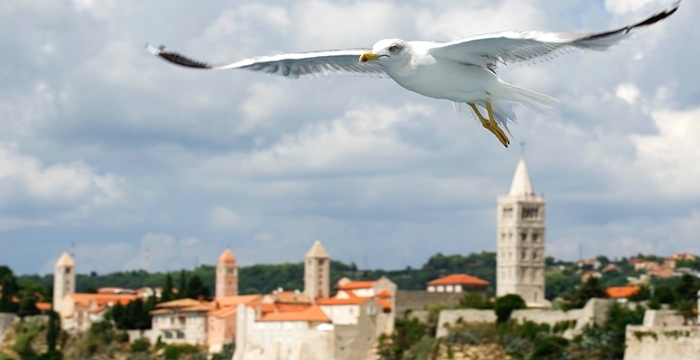 Lopar is a small tourist town on the island of Rab known for its numerous sandy beaches. There are 22 sandy beaches around Lopar, and most famous beach is 1.5 km long "Paradise Beach", near which are most hotels and apartments as well as the resort San Marino****, the biggest campsite on the island. In addition to "Paradise Beach" we recommend the beaches "Sahara" and "Ciganka" and there are lots of smaller beaches in the numerous bays and they are all sand beaches. In Lopar is the Church of St. John the Baptist, the patron of the parish of Lopar, and on a nearby hill in the pine forest the church of the Blessed Virgin Mary from the 14 century is located. A hotel worth visiting is Hotel Plaža*** offers numerous spacious rooms and suites and is a great fit for families or friends who travel together. Lopar is also known by the Rab crossbowmen, which in many summer events attract the interest of tourists. Lopar is suitable for families with children and young people who want an active life, sport and entertainment. You will find a wide selection of private apartments to rent if you take a look at No Name apartments. Kampor is a small town located only 12km from town Rab. It is home to many more sandy beaches and Lando resort which offers many spacious apartments for 4 people. Villa Lucija and Villa Tomislav are a perfect fit for those who want to spend their holidays in private apartments in Kampor. We offer total 301 facilities.